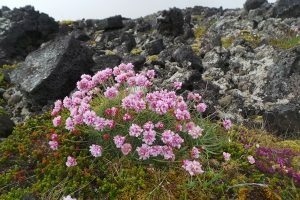 Sea thrift and creeping thyme in lava fields of Snæfellsjökull National Park, Iceland. Sea thrift, Armeria maritima, is an herbaceous perennial in the sealavender family (Plumbaginaceae) native to mountains and temperate coastal areas of the northern hemisphere, especially northern Europe, from northern California to Iceland to Siberia. There are several geographic subspecies that vary mainly in flower morphology and pollen structure. It is often found in salty coastal environments where few other plants can grow well. 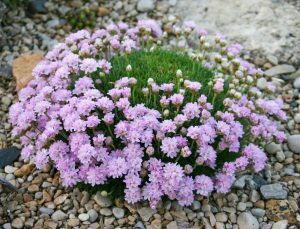 Also called common thrift or sea pink, it is hardy in zones 4 to 8. The linear leaves grow in a basal rosette. This compact evergreen plant grows only 6 to 12 inches high and across from a woody tap root. The slowly expanding mounded tuft is composed of numerous stiff, linear (needle-shaped), dark-green leaves that usually have hairs along their margins. This dense rosette gives the appearance of a low-growing ornamental grass. In richer soils the leaves tend to fall outwards leaving an open center. 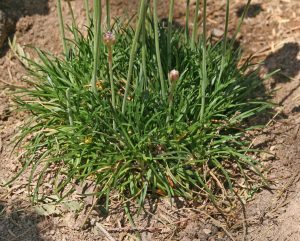 Since it is evergreen, it should not be cut back to the ground in fall like many other perennials as that will affect spring bloom. In mid-spring small pink to lavender (or sometimes white) flowers are produced in globular clusters subtended by purplish, papery bracts on the ends of slender, unbranched, leafless stalks that extend well above the foliage. Each flower has five petals joined at the base with five stamens and five separate styles. Deadhead entire flower stems to promote additional sporadic flowering throughout the summer. They can be used as cut flowers. The flowers are followed by papery seed heads with a single seed in each capsule. Flowers are produced in clusters from buds held well above the foliage (L and LC). Each flower has white to pink petals (RC) and are followed by papery seed heads (R). Sea thrift grows best in full sun in lean, very well-drained soil. The plants are drought tolerant and do not tolerate moist soils. They frequently rot in the center, killing the entire plant, in heavy clay, soils that are too fertile, or after a prolonged wet and cool fall. Because of this they have a reputation for being short-lived. However, given the proper environment these plants can live for many years and require little maintenance. Partial dieback (L) and central rot that killed the tap root (R). Armeria maritima ‘Victor Reiter’ in a rock garden. Use sea thrift in rock gardens, for edging the front of a perennial border, or massed together in dry, gravelly to sandy beds. Its dense, mounded shape offers good textural contrast with other low-growing plants even when not in bloom (but place it where it will not be overgrown by taller, spreading perennials). It can be used in mixed containers with other small plants. It is excellent in trough gardens which provide the perfect drainage it requires to do well and it is unlikely to be overrun by other larger plants. Sea thrift is fairly easily propagated from seed, generally flowering in the second year. Sow seeds in spring or fall. It can also be propagated vegetatively by division in spring or basal cuttings taken in summer. ‘Alba’ – is smaller than the species (grows about 5 inches high and wide) with white flowers. Armada™ Rose – has bright rose pink flowers on 6-8 inch high plants. There is also a white cultivar in this series. ‘Bloodstone’ – has bright deep pink, almost red, flowers. ‘Cotton Tail’ – is a short cultivar (6 inches high) with white flowers. ‘Dusseldorf Pride’ – has deep pink to wine red flowers on plants 4-5 inches tall and usually repeat flowers in the fall. ‘Laucheana’ – has darker green foliage and bright pink flowers that rebloom intermittently. ‘Nifty Thrifty’ – this British selection has variegated foliage (a white stripe down the edge of each leaf). ‘Rubifolia’ – has magenta-pink flowers and dark burgundy foliage in a mound 4 inches high and 6 inches across. The leaves become greener during the heat of summer. ‘Splendens’ – has deep pink flowers. ‘Vindictive’ – is a lower-growing form that is recommended as a ground-cover. When should this plant green up and bloom in central MO? I really like how this plant looks-it says Zones 4-8, so this would work in Wisconsin rock gardens even if it is not in a salty environment? For the people who commented above, you have had success with this plant-any advice? I have this plant in my front walk way where it can be noticed easily. it is delicate and fun to watch flower. I did not know it was an evergreen and should not be cut back. good to remember this. Very interesting article. I have not tried this plant in my garden & am glad to know that it’s not the best in my heavy clan soil but I would like to try it in my window boxes. The flowers have a delicate beauty. Does this grow along the lakefront anywhere? Susan, I loved your Iceland photos!! I love this little plant! I needed a small perennial that would enjoy the heat from my brick house. It’s perfect. Would love to find one of those for my rock garden. I think it would do well here in the sand. I like the fact that it’s evergreen and would add interest to the garden all year. I have to look for areas in my garden that wouldn’t be as moist to avoid the issue with the rotting center. Would like to try this in an area that gets no supplemental water. Hoping for the best! I have used sea thrift for several years, love it in my dry gravel soil. I was introduced to this plant by a fellow master gardener. She offered me one when she was dividing hers and I love it. I have a lot of rock gardens and because of its miniature size it fits in perfectly. This little compact evergreen plant is truly unusual. I am amazed that it blooms throughout the summer. Interesting plant and very nice flowers. I am going to keep my out for it during my travels. I’m glad the article mentioned the different kinds of soils and water necessary to maintain a healthy blooming plant. I found this article interesting and think this plant is quite cute. It is interesting that it can grow in saltier and drier climates. The Nifty Thrifty British version sounds lovely with its verigated leaves. I am wondering what biological adaptations it has made to live in saltier soils? I was not familiar with this plant before reading about it. I like the fact that it does well in a sunny location and is drought tolerant. Interesting! This plant would probably work well in my gardens as we have very sandy soil.